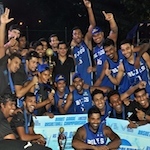 India's recent upward basketball surge has raised several eyebrows around Asia. The national team recorded their highest ever finish, by finishing eighth at the FIBA Asian Championship this year. However, among the 16 participating nations, India was the only country, yet to have launched a domestic professional league. Despite the infrastructural and infighting issues within the Basketball Federation of India (BFI), the national team has quietly gone about its business with little or no exposure, during a calendar year. Central to the team's success has been an unlikely foundation laid in Western Uttar Pradesh. The religious town of Varanasi, which is often related to pilgrimages and sanctity, has produced some of the top basketball players of our country. The 2006 Commonwealth Games highlighted the dominance of Varanasi over the domestic game. Both the Men's and Women's team Captains, Trideep Rai and Divya Singh were products of a small basketball court located in Udai Pratap College in central Varanasi. But you don't even have to go that far back to see how basketball culture is embedded into everyday Banaras life. Current National team Captain, Vishesh Bhriguvanshi, finished second in the assists charts of the Asian Championships, grossing 4.8 every game. That piece of statistic however becomes more relevant considering India never made it beyond the Quarter-finals. The sport was relatively unknown in the area till the late 1980's. In 1988, the Sports Authority of India (SAI) conceptualised the NSPC programme. The programme's goal was to acquire the services of 86 school and colleges across the country, to promote various sports. SAI basketball coach Amarjeet Singh, who is often known as the 'Father of Basketball,' first arrived in Varanasi for the programme. Little did he know, that his vision would go on to revolutionise the sport in India. With no infrastructure prevalent in the town, apart from a single basketball court, Singh began the work from scratch. His first job was to convince kids to take up the sport. Between 1988 to 1990, the coach from Jammu set up various age categories, but sadly received only seven children to begin his work. So, he set about on a mission to convince kids with good height and potential to take up the sport. The sheer number of negative responses motivated Singh to prove his doubters wrong. By 1992, Singh had successfully set up teams in almost every possible age category. He has also put up a training system in place, where the one single court could be shared by each and every age group.